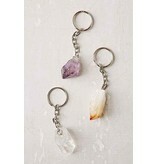 Amethyst is an extremely powerful and protective stone with a high spiritual vibration. A natural tranquilizer, it blocks geopathic stress and negative environment energies. It has strong healing and cleansing powers, and enhances spiritual awareness. Citrine is a powerful cleanser and regenerator carrying the power of the sun. It absorbs, transmutes, dissipates, and grounds negative energy and is therefore extremely protective for the environment. Quartz is the most powerful healing and energy amplifier on the planet because of its unique helical spiral crystalline form. Found worldwide, it absorbs, stores, releases, and regulates energy and is excellent for unblocking it. 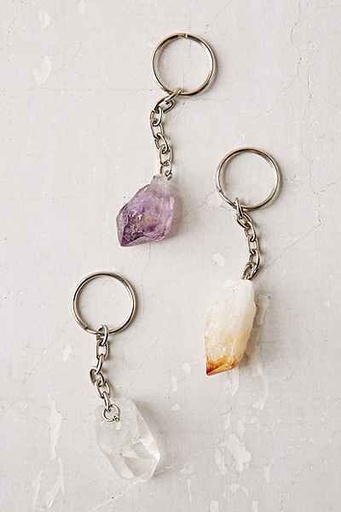 perf keychain that helps me not lose my keys! and keep the vibes good.